« Guest Post on Good. Food. Stories. Everyone likes freebies. It’s okay to admit it. You, over there in the white T-shirt advertising some website or business — I’m willing to bet you got that sucker out of a T-shirt launcher at a sports game! If you like kitchy things like pens, calendars, travel-sized toiletries, then you’ve probably got shelves full of the stuff. For those new to the idea, here are a few things you can snag for nothing. There are other things you should never pay for, such as music (the kind on the radio or in your legally-gotten CD collection, of course), calendars and birthday meals. If you patronize a local businesses, December and January are banner months for getting calendars of all types and sizes — the small fridge magnet, the pop-up kind for the desk, or a wall calendar. I get mine from our local bank, while my husband’s aunt usually gets a desk calendar from her nail salon. If you see another patron gifted with one, make sure you ask for yours on the way out! These are the go-to giveaways for businesses, especially those with tables set up at expos, on the boardwalk or at sporting or music events. The credit card companies, in particular, like to give away lots of stuff. Grab a pen or two and a notepad, and you’ve got what you need for your weekly grocery list. But I’d pass on the credit card application, though. We all know someone who’s done it at one time or another — told the waiter that it was a friend’s birthday, therefore triggering the staff’s “Happy Birthday” singalong while proffering a birthday dessert with a candle on it in front of the celebrant’s face. Be careful, though, because sometimes the desserts are not free. For those who aren’t shy, ask the establishment you’re in if there are any free perks for you because it’s your birthday. Perhaps you’ll get a free ice cream cone or the like. Just be prepared to cough up your ID to prove that it’s your special day, if asked. Another way to get a free meal is to make sure you’re on the mailing lists of all of your favorite dining establishments (especially the chains) — most will send you a coupon for a free birthday meal or dessert. This is pretty simple. 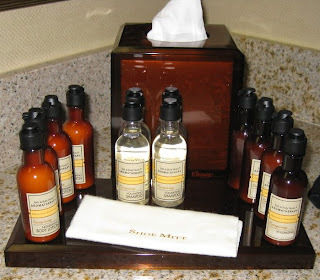 If you’re staying at a hotel, you’re bound to find an array of shampoo, conditioner, body wash and lotion in little bottles for your use. I’ve also seen items like showercaps, toothpaste and even condoms laid out for use. Grab whatever’s not nailed down when you leave. Chances are you’ve already used a portion of the shampoo/conditioner in the shower, so you may as well take the rest with you, right? Another way to get no-cost toiletries is to search online freebie sites and request free samples online through manufacturer’s websites. Sometimes this involves doing a short survey, but you may wind up with a three-day supply of the newest anti-wrinkle cream or a few pouches of body wash for your trouble. Another no-brainer. Why pay for satellite radio when there are radio stations online and in the car that are free to listen to? Remember the days of dubbing cassette tapes? Make your own mix CD or add your music to your iPod. One word: Libraries. Need I say more? An alternative — albeit a less likely option — is to become a book reviewer and have tons of advance copies sent directly to you before they’re out on the shelves. Surely you’ve been given gifts in the past year for a birthday, anniversary or Christmas. Save the bags, tissue paper and bows to reuse for future gift-giving occasions. I can’t remember the last time I actually bought this stuff.